I am excited. Tonight marks the start of my favourite television series, ‘The Great British Bake Off’. If you haven’t a clue what that is, it’s a show on the BBC where bakers compete to be the Great British Amateur baking champion. This year I think there are twelve competitors. Each week they have to perform three challenges for the judges, the one and only Mary Berry and Paul Hollywood – a Signature Bake, Technical Challenge and then a Showstopper. At the end of each show one person is sent home. Each episode is themed so one week could be bread, one biscuits (cookies), one pastry and so on and so forth. Tonight is also the start of a new challenge for me and the blog. Over the duration of the show, I will bake at least one of the bakes from each episode and share the results with you. As I named this blog, ‘Emma’s English Kitchen’ I think it is about time a baking element was included. It has been a while after all. Plus it will give me the chance to get away from the chocolate chip habit we seem to fall into in our house – chocolate chip cookies, pumpkin chocolate chip cookies, chocolate chip muffins, banana and chocolate chip loaf cake…anything containing them is guaranteed to get eaten. I made the mistake of making raspberry and coconut squares the other week. Being the only one who likes coconut in the house, I ended up eating most of them. They were delicious – if you like coconut. Last year my take away recipe from the show was Paul Hollywood’s Apricot Couronne – a sweet, fruit and nut bread twisted into a crown and topped with icing. A yummy mid morning or afternoon tea treat. You can see what it looks like here. Every week of the show usually has something I want to try out so it’ll be fun to share the experience. At the moment I am trying to cut down on eating the baked goods with a few slip ups here and there. It’s so hard to keep my hand out of the biscuit tin, though it is easier when the garden is producing so many lovely vegetables. 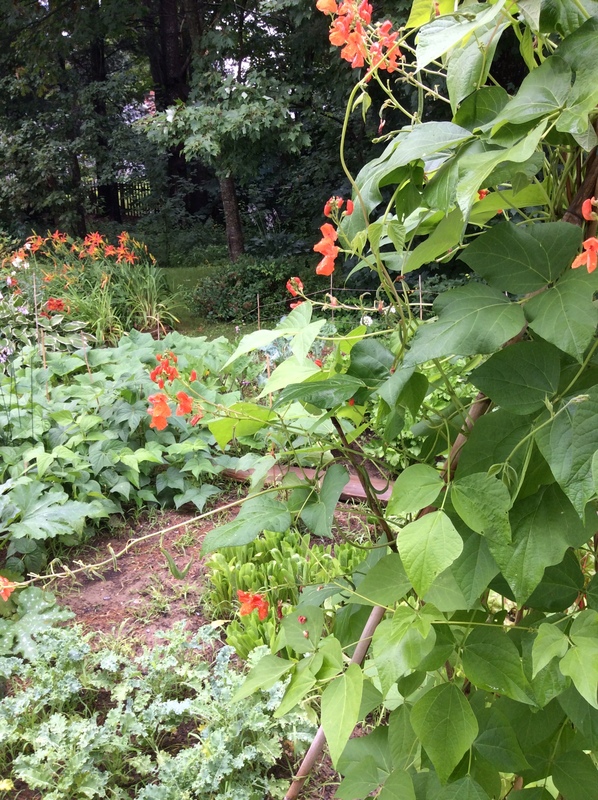 So far we’ve had plenty of green beans, several cucumbers, three ripe tomatoes (! ), some snow peas, kale, swiss chard, lettuce, a few courgettes/zucchini, plenty of basil, parsley and oregano, radishes and one aubergine/eggplant. Usually by the time the middle of August comes we’re overrun with courgettes and I end up making zucchini bread or chocolate zucchini cake – and, no, the children are not fooled if I call it just ‘chocolate cake’. I’ve just realized that last time I posted, my youngest daughter’s birthday had happened during the hurricane weekend and I hadn’t been able to make a cake. I did eventually get round to it. Smartie covered red velvet cake, as requested by her. Three layers of naughtiness. I look forward to sharing my bakes each week and, hopefully, being able to post about something else in between. Previous Post Should’ve listened to Frankie! I’m looking forward to this, Emma, and if you need to dispense of any of your baked goodies, just sing out! 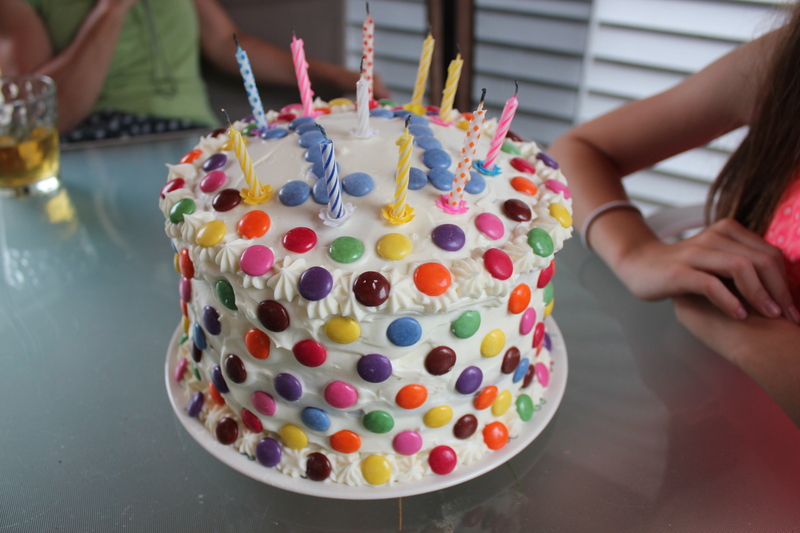 BTW, that smartie red velvet cake looks like a celebration all by itself. 🙂 I’m sure it tasted that way, too.